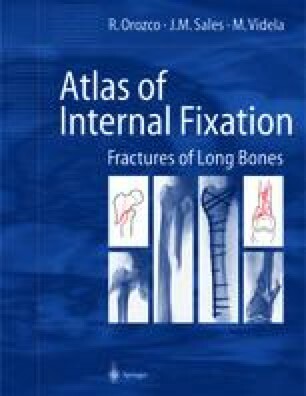 The fractures of the diaphyseal segment of the femur (14.56% of the total), the biggest diaphysis of the skeleton, are of special seriousness, both when occurring in isolation and in the multiple injury patient. The increasing frequency of traffic accidents that cause multiple high energy fractures has encouraged the development of emergency surgical procedures to stabilize the fracture site, not striving for the anatomic reduction that some of us still consider important. The extrapolation of the biologic internal fixation concept (maximum respect for the preservation and vascularization of the fragments), that we have always observed, and the relative ease of performing unreamed nailings or multiple nailings, are the causes of the popularity recently attained by the interlocking nailing techniques. These techniques are neither easy nor risk free, but this does not mean that they do not have precise indications. In any case, they are not the cure-all technique for the treatment of any fracture of the segment, as we will try to demonstrate in the following pages.